Welsh Artist Jen Delyth creates original Celtic Art, inspired by the Spirit in Nature, Celtic mythology and symbolism. Jen's original Celtic Art work appeals to those who seek meaningful, profound images expressing deep and essential aspects of the Celtic tradition. "For me it is the creativity and rhythm, the power of the symbols beneath the work that are most important." 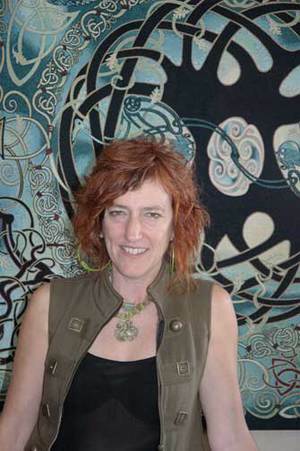 Jen Delyth’s original Celtic artwork has been widely published and exhibited in North America, back in her native Wales and Internationally. She illustrates the best selling “Celtic Mandala” calendar, journals and greeting cards, and has created a successful textile and gift line - Keltic Designs by Jen Delyth, that showcases her designs, fine art prints and paintings which have been exhibited with solo and group shows internationally. 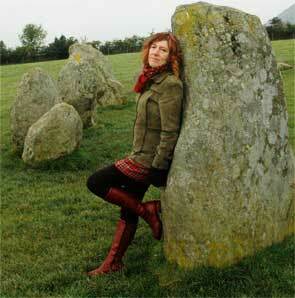 Also a writer on Celtic Mythology and Symbolism, her book Celtic Folk Soul - Art, Myth & Symbol is compliation of her artwork and writing from over 20 years. “Growing up in Wales, I was fortunate that we explored many wonderful ancient places, full of history and resonance that inspired and formed me. It often seemed as though the land itself was haunted by the long-ago people, and I could sense the mythic quality of things even as a young child." Although I am not affiliated with any particular branch of Celtic spirituality, my work often focuses on an expression of my deep love and respect of nature and all its Mystery. The Celtic tradition expresses a wealth of wisdom and understanding of the natural world - of plants and animals, and also the inner world of active imagination and our psyche. Working with the patterns, sacred images and myths of the ancient Celts renews my connection between the past and the present, the inside and outside, the seen and the unseen. Life in all its Mystery and interconnectedness, through art and story. Celtic Art by Jen Delyth Jen Delyth's original Celtic Tree of Life design has become a well known symbol for the interconnection of all living things. It represents Jen's artwork, and company Ninth Wave Publishing - Celtic Art Studio. Please check our licensing Page for more information.